Is LottoTime a Scam or Legit? Read Reviews! If the online lottery site LottoTime.com looks familiar, then you probably have looked at Superlottos.co.uk – they are owned by the same people and except for the name change and a bit of artwork, they offer the same thing. This is an online lottery provider that offers ticket purchases for nine lotteries, syndicates and bundling. The only problem is, the more we dug into this site, the more questions we had. Let me explain. LottoTime offers players nine international lotteries to play, including US Powerball & Mega Millions, Euro Jackpot & Euro Millions, SuperEnalotto & BonoLotto, Mega-Sena & German Lotto, plus Keno. Okay, it looks like Keno is their own game as there is no information on it other than the info on playing and the fact the game originated out of China. LottoTime also offers syndicates and bundling. Bundling is putting together a bunch of different lotteries in one purchase. At first glance, the only way to find out what it costs to play is by logging in. It wasn’t until one of the team hit “add entries” that the price for a lottery ticket came up. It does appear, this online lottery provider does allow for single ticket purchases. We tried the multiple draws (they offer 1, 4, 8, 16 and 52 weeks) but it didn’t kick any discounts. The share side of syndicates is a little weak and players have a minimum purchase of one week. Bundling has a two week minimum purchase. It’s not so much what they say, but what they don’t say. Winnings can be deposited to your bank account or converted to credits to play more lotteries. There is no information on a threshold for withdrawals, whether they take a commission or what fees and/or charges will take place. There also appear not to be any discounts for multiple draws, though this information might be available once you login. None of the team would do it. Don’t think about going into their terms and conditions for answers as it’s very limited. 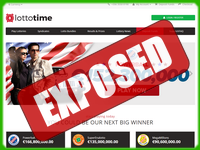 LottoTime is operated by Lottocore Ltd. which is a website that advertises “Your lottery purchasing ticket application”. We did a bit of a search but so far haven’t found any other sites that belong to them – then again, who knows who else is using this platform. They are registered out of Torola in the British Virgin Islands and regulated by Curaçao. The only contact details are an online form, snail mail address in Tortola and a phone number for Malta that doesn’t work. They are “open” Monday to Friday from 9:00 am to 7:00 pm though it doesn’t say in which time zone. Would you mind rating LottoTime.com? As the team has said over and over again, the minimum requirement for an online lottery provider is good communication. Besides the fact they are supposedly only open Monday to Friday, their telephone number does not work and so far they haven’t answered any of the inquires sent to their online form. Sorry folks, that doesn’t cut it! This site gets a thumbs down. Ditto goes for Superlottos.co.uk! If I am going to give my personal and credit card details to anyone, I definitely want to know they are real and will talk to me. Strike one was the limited terms and conditions. This is so important to playing online lotteries. Strike two was the lack of contact details especially the phone number not working. Strike three is no information whether they take part of your winnings through commission and more details on getting your winnings. They’re out.